I’m fascinated by the intersection of character & setting. It’s the nature vs. nurture phenomenon of shaping compelling characters, begging the question does the setting shape the character or does the character exist independently of the place? But they all journey to another place, and in doing so, grow and change as a character. By taking a character out of their home environment, we can see them in a new light. Harry Potter is who he is because of Hogwarts, Alice is who she is because of Wonderland. 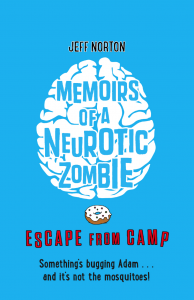 In writing the follow-up to Memoirs Of A Neurotic Zombie, I wanted to explore my characters outside of the comforts of their rural university town of Croxton, Ohio (based on Oxford, Ohio) and send them to summer camp. Well, first of all, it’s a great way to get young protagonists away from their parents without actually killing off the parents. Second, there’s an element of fantasy, like boarding school, that goes with sleep-away camp, and thirdly, it’s a place where a young person can choose to reinvent themselves (free from the labels and expectations of school life). While Adam Meltzer, my neurotic hero is very much a character shaped by his home surroundings, he comes into his own – as does Corina the vegan vampire and Ernesto the reluctant chupacabra – at camp. …and it’s where we really get to know what Adam’s made of. Happy Princess Ponies publication day!